Profits are the motivation for business activity and ultimately the means through which firms can continue to exist and grow. The Profits Perspective is a view of the economy that focuses on the flows of funds that determine total business profits. It is rooted in the profits equation, an identity derived by Jerome Levy in 1908. It is also closely tied with the work of Hyman Minsky, a 20th century economist. Profits are obviously important to the behavior of the business sector, yet they are often ignored in economic forecasting. Profits are the motivation for business activity and ultimately the means through which firms can continue to exist and grow. Therefore, changes in profitability are key to understanding decisions that the business sector will make on employment, output, and investment in the future. One basic view, the neoclassical paradigm, has to an extraordinary degree monopolized macroeconomic thought during the past fifty years. It has dominated macroeconomics as taught in colleges and graduate schools, as employed in business economics and as applied in public policy analysis. It has been the basic framework shared over the decades by Keynesians, monetarists, supply-siders, and other groups of economists. In the neoclassical paradigm, profits do not exist, or rather, they continually gravitate to zero. The assumptions that profits equal zero at equilibrium and that the economy continually approaches equilibrium produce a definition of profits that is very different from the definition accountants and business people use. In the real world, where economic performance is continually changing in level and character, swings in profits from quarter to quarter, year to year, and even era to era are vital aspects of the story. Economic practitioners involved in business cycle or macroeconomic policy analysis tend to be heavily influenced by the academic tradition in which they were educated. Therefore, when they do address the issue of total business profits, their macroeconomic theory is of little help. Many resort to generalizing from microeconomic analysis, and, in doing so, frequently commit the logical sin known as the fallacy of composition—assuming what is true for one individual is necessarily true for all individuals together. For example, analysts widely cited cost-cutting through job elimination as a positive force for profits in the early 1990s. Yet, the macroeconomic impact on profits was not so simple. Every job eliminated also represented lost personal income and lost consumer spending; that is, it represented lost business revenue as well as reduced expenses. The Profits Perspective, unlike more common macroeconomic frameworks, encompasses not only flows of funds (profits, GDP, personal income, and other “income statement” concepts), but also levels of assets and liabilities (real estate, P&E capacity, inventories, debt, stock market capitalization, and other “balance sheet” concepts). 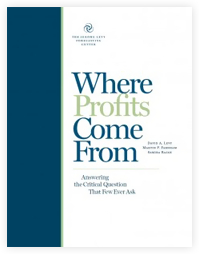 Thus, the profits approach facilitates analysis of the effects of economic activities on household, corporate, and government balance sheets and conversely, the impact of changes in balance sheets on profits and economic activity.